Based on Hans Christian Anderson's wonderful story of The emperor's New Clothes. Wee Stories present the Emperor's New Kilt, a festive musical comedy for all the family. The story takes place on the extraordinary island of Kiltie, an island that lies far out on the horizon in the North of Scotland, an island that only clever people can see. 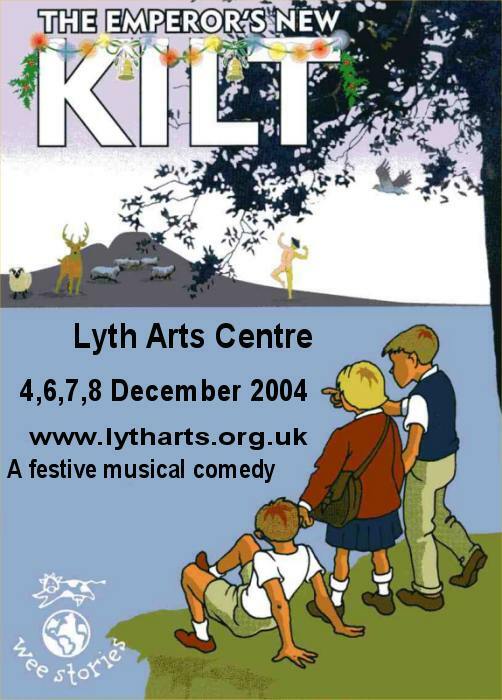 Kiltie is ruled by a very powerful man, and the entire island and everything on it is his empire (even the sheep and the wool on their backs): so he is the emperor, but because this is Scotland, everyone calls him the Laird! The Laird's favourite things in the whole world are his kilts! He owns 365 of them. One for each day of the year, plus some more for special ocassions. for is birthday all he really wants is another one, an extra special kilt, the likes of which has never been seen! Come and meet all of the island's colourful characters as they prepare for the Laird's party and a birthday surprise never to be forgotten! An adventure that is perfect for everyone 5 years old and over. Running time 90 minutes with one interval.